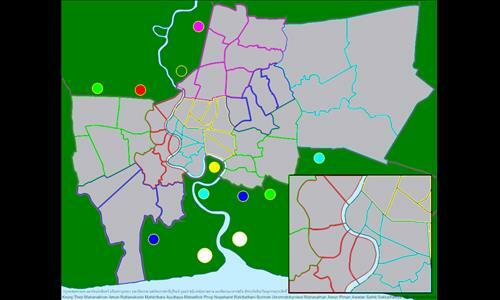 The city of Bangkok, by districts. The bonuses are completely made up, since there are no other divisions to use. Have fun playing! Review by Muppet on 4/1/2012. Moros, this map looks absolutely wonderful and I like that you've included the full name of Bangkok in Thai at the bottom. I understand why you've designed the inset as you have, but I found that in reality it made the map very difficult to play on, especially since only some of the territories connect across the river (And not via the bridges). At the very least, would you consider re-drawing the river connections to make them more visible/obvious? Zooming in to see them makes it awkward to execute orders. Personally, I think the best thing you could do to make the map more playable would be to combine Sampantawong and Pom Prap Sattru Phai into one territory (you could name it "___ and ___"). Then you could keep all the army numbers on the large map and use the inset just as a visual.